When you think of sports injuries, full contact sports like football probably come to mind. However, one of the most dangerous sports in terms of serious injury is not football, soccer, or basketball…it’s cheerleading. Cheerleading has become so much more than shouting encouraging phrases from the sidelines. Modern day cheerleading features amazing feats of gymnastics and flexibility along with dance and of course, stunts. A basket toss can send a cheerleader flying 20 feet in the air, only to land in the arms of her teammates, if everything goes right. It’s not hard to see how cheerleading can be dangerous. Even with human pyramids, choreographed gymnastic passes and more, some might not even consider cheerleading a true sport; in fact the National Collegiate Athletic Association (NCAA) does not even include it in their list of sponsored sports. But it doesn’t change the fact that from 1980 to 2013, cheerleading injury rates went up 440 percent. Compared to other sports, the overall number of injuries is actually low. 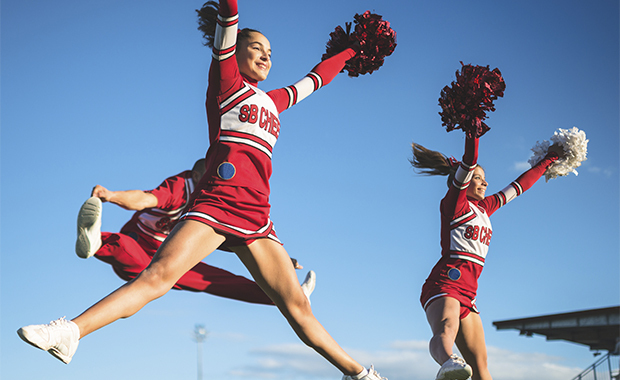 However, cheerleading injuries are often much more severe, making up 50-66 percent of catastrophic injuries in female athletes. A catastrophic injury is defined as a severe injury to the spine (including the spinal cord) or brain and may also include skull or spinal fractures. Cheerleading injuries affect all areas of the body. The wrists, shoulders, ankles, head, and neck are most commonly injured. Sprains account for more than half of all cheerleading injuries. While ankle sprains are most common, sprains can also occur in the knees, wrists, neck and back. Back injuries are also common in cheerleading, largely from tumbling and stunts. Back injuries can be caused by twisting and rotating in stunts or tumbling passes and from lifting, catching, or falling during stunts. Concussions are also becoming increasingly more common in cheerleading. With more evidence of the damage head injuries like concussions can cause, there has now been a heightened awareness of cheerleading related injuries overall. Some of the causes for cheerleading injuries are lack of training (especially with stunts), lack of conditioning and that there is no protective gear for the sport. The best way to avoid injury is to prevent them from happening. It’s no surprise that stunting causes the most serious injuries in cheerleading. Stunting accounts for 42 to 60 percent of all cheerleading injuries. In addition, 96 percent of concussions and head injuries in cheerleading are caused by stunts. Without the proper training on how to toss and catch the flyer, along with practice, these injuries will continue to occur. Other stunting restrictions include height restrictions in human pyramids to keep them level and increasing the number of spotters during aerial stunts. Mats should always be used during practice, as cheerleading is one of the only sports where more injuries occur during practice than in competition. The lack of recognition of cheerleading as a sport has lead to a lack of qualified coaches. Often, coaching is done by a member of the school’s faculty who may not have any experience with cheerleading, or at least not some of the more physically demanding aspects of it. At a minimum, a cheerleading coach should know proper stunt technique, should always supervise practice and should be able to identify the symptoms of serious injury like concussions. Like any other sport, proper training and conditioning can help prevent injury. First and foremost, stretching before practice and competition can loosen the muscles and help prevent strains, sprains and pulls. Yoga or Pilates can also help cheerleaders improve flexibility. Strength training can also help prepare muscles for lifting either your body weight or a teammate during stunts. Special attention should be paid to strengthening the back and shoulders are well as the core muscles to help reduce the risk of injury.